All of the characters were welcomed with open arms by Twitter users and they actively engaged each other. No one cared whether or not AMC was behind them. It was irrelevant. Everyone was having fun with people from one of their favorite shows. Not to be slapped down easily, the person behind the Peggy Olsen character re-created an account using the name @pegy_olsen whop tweeted, "I worked hard. I did my job. 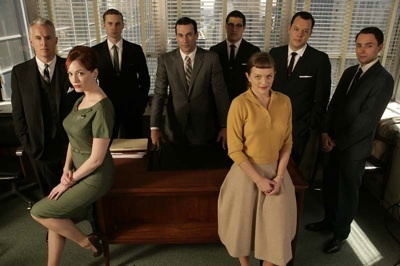 But the boys at Twitter are just as churlish as the boys at Sterling Cooper. Such a pity that they're so petty." In truth, it isn't Twitter that's being churlish. Twitter just did what it was legally asked to do. It's a sticky situation for sure but one of the best ways for a brand to gain footing in social media spaces is to identify already-existing relevant activity or content that can be put to use. Stride Gum did it brilliantly with worldly dancer . They identified his already popular videos and offered to fund and sponsor future videos. The outcome was amazingly successful. While a company certainly has to clearly state their relationship, if any, with entities purporting to represent the brand in any media, slapping down fervent supporters as opposed to forming a partnership does more harm than good. For AMC, Twitter is (was?) one of the best places in which they could have chosen to participate. Among Twitter users, there is a very high concentration of people who could be dubbed "social media experts" as well as many people who work in marketing and advertising..and who watch Mad Men. The reaction to the removal of the Twitter users won't be volatile. There won't be any sort of boycott or "We Hate AMC" campaigns but it will leave a bit of a sour taste in the mouths of Mad Men fans. It may also be categorized as a missed opportunity that could have benefited AMC, rather than make it look like the bad guy. UPDATE: 8/27/08. AMC called off the legal eagles and has allowed the Twitter profiles to remain. I can't say I blame AMC for protecting their property. I had a bad experience communicating with the Don Draper character on Twitter, which initially left me (incorrectly) thinking AMC shouldn't be on twitter if they don't know how to communicate positively w/ fans on it and left me with a bad taste in my mouth for the show. I'm thrilled to hear it wasn't AMC behind those tweets, because they were poorly handled - and now I know why. i guess i'm the only one who saw the madmen tweets as being a silly anachronistic since the show takes place in the 1960s. you know, before computers n' stuff? however it does make me want to start a twitter account as charles phillip ingalls (micheal landon's character from 'little house on the prairie') tweeting about how laura elizabeth must help milk the cows more. I love Mad Men... but I do wonder, aren't there real people out there with the same names as the characters? If someone suddenly created a TV character with my name, would I suddenly have to relinquish it to the Almighty copyright holder? Actually, since Twitter provided no explanation for their actions, they were, indeed, being churlish. I took my "job" seriously, so it is disheartening, to say the least, to be tossed out like so much trash, whomever is at the root of it. @Mario -- you're right in your blog post -- Mad Men writers taking over the accounts would be the dream solution, although unlikely. Perhaps one day (soon) having a social-network strategy in place will be seen as necessary as a Style Manual for Logo treatment. I can fully understand AMC wanting to protect their characters and branding. At the same time though, they had social networkers out their promoting their show for free. I have to agree with this article, it's a real missed opportunity for AMC to take advantage of this. If the people behind the Mad Men twitter characters want to speak in character so badly, why not take it to fan fiction rather than character-jack the brand on twitter? Evan; duh. They're running a simple ARG, which requires a bit of suspension of reality. I followed a few of the Mad Men characters and was followed back by others. It's been fun. It's gotten me excited to hit the DVR to see last night's show. I think the update should be at the top of this story. Or there should be a new story written about it. Sure, AMC made a big mistake, but, at least it realized its error and has taken steps to correct it. We created a social site for the twitter fan fic character portrayals. It has fan groups, character blogs and profiles. It's an extension of the twitter profiles.